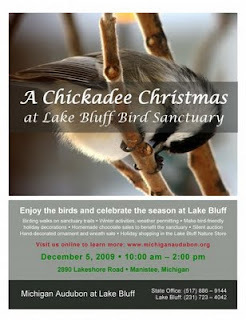 Don't miss this winter's Chickadee Christmas at the Lake Bluff Bird Sanctuary. The fun filled event will take place from 10:00 a.m. until 2:00 p.m. on Saturday, Decemeber 5th. Take part in guided nature walks around the property, make a bird feeder from pine cones, or place a bid on an evergreen wreath or other items during the silent auction. Work of local wildlife artists will be on display and there will be homemade chocolates for sale. Chickadee Christmas is part of Manistee's annual Victorian Sleighbell Parade and Old Christmas Weekend. For more information on that event and its numerous activities,visit the Manistee County Chamber of Commerce website at Manistee Chamber of Commerce. For more information on Chickadee Christmas contact Wendy Tatar.